There are road rule changes if you are planning trip to New Zealand this year. You probably heard about right-hand rule in New Zealand. From 5am on 25 March 2012 this rule will be obsolete. 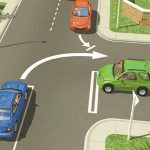 The new rule will be in force: vehicles turning left will then have right of way over those turning right. This applies at cross roads, T-intersections and driveways where both vehicles are facing each other with no signs or signals, or the same signs or signals. On NZ Transport Agency website you can find details of new rules, illustrations and explanations. Hopefully it will reduce confusion for tourists travelling in NZ and it will be less accidents on roads of New Zealand.